Caring Transitions of South Oakland County brings move and senior relocation specialists to Royal Oak, Troy, Beverly Hills, Bingham Farms, Birmingham, Franklin, Bloomfield, Bloomfield Township, Bloomfield Hills, West Bloomfield, and the surrounding areas. 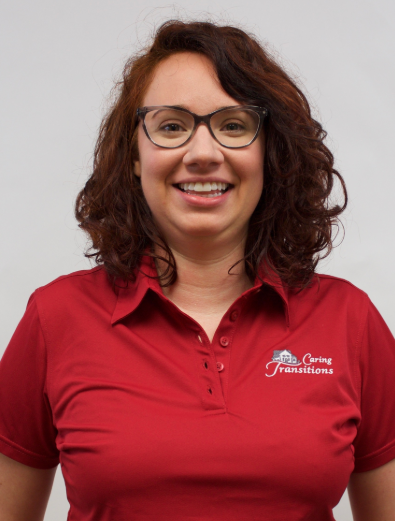 After a career in Human Resources and many years as a volunteer with Meals on Wheels, Kelsey Florek is now pleased to be working with seniors and families full time through her new business, Caring Transitions of South Oakland County. Caring Transitions’ specially-trained team can handle organizing, packing, de-cluttering, moving, resettling, in-person and online estate sales, liquidations, and preparing homes for market. Caring Transitions specializes in assisting seniors, but their services are for any families or individuals in need of help. Caring Transitions of South Oakland County serves Royal Oak, Troy, Beverly Hills, Bingham Farms, Birmingham, Franklin, Bloomfield, Bloomfield Township, Bloomfield Hills, West Bloomfield, and the surrounding areas. Caring Transitions’ services are perfect for managing the many aspects of a move or assisting with the process of downsizing. Their services can also help families clearing out the home of a loved one who has moved into assisted care or has passed. All of Caring Transitions’ services are customizable, so clients choose the solution that best fits their needs – whether that means managing the entire move and estate-clearing, just getting someone resettled into their new place, or anything in between. “When we meet with a potential client, we aren’t there to sell a service. We are there to listen, understand their situation, and determine what services we can offer to provide them with the best possible solutions. We want the family to decide where we can come in and help. Our goal is to help decrease their stress,” Florek said. “Sometimes the transitions people face aren’t easy, so I’m honored to be a resource people can rely on to help get them to the next chapter of their lives,” she added. Florek, a life-long Michigan resident, understands the tensions that sometimes come with life’s more challenging transitional periods. In fact, she has experienced firsthand how a family transition can affect everyone involved. 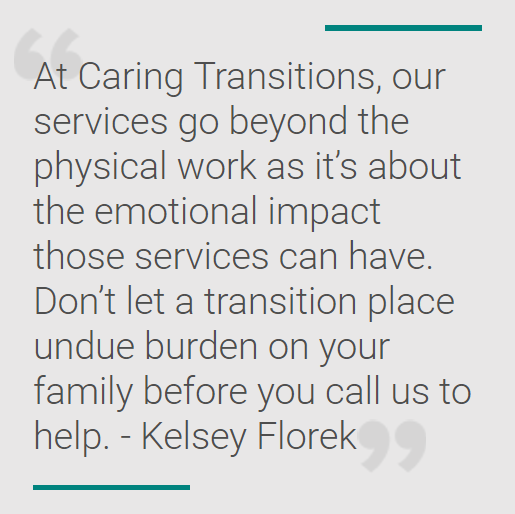 She wishes that there had been a service like Caring Transitions that could’ve helped her family to better navigate their own difficult time and hopes to be that resource for others. “I’m certain almost everyone can think of a time when the services we offer at Caring Transitions could have made a difference in their own life or the life of a loved one. At Caring Transitions, our services go beyond the physical work as it’s about the emotional impact those services can have. Don’t let a transition place undue burden on your family before you call us to help,” Florek said. Caring Transitions is bonded, insured, and their W2 employees have been background checked. For additional information, call (248)282-4647, email KFlorek(at)CaringTransitions.com, or visit http://www.CaringTransitionsSOC.com. About Caring Transitions Caring Transitions, founded in 2006, is the first national franchising concept specializing in senior relocation and transition services. With more than 200 locations throughout the United States all owned and operated by Certified Relocation and Transition Specialists, Caring Transitions provides clients with supportive moves, liquidations, auctions, rightsizing, and transitions. This includes expert advice plus a well-executed transition plan beginning with the initial sorting of personal belongings through packing, shipping, and selling of items to the final clearing and cleaning of the property. For more information, visit http://www.caringtransitions.com or visit us on Facebook.